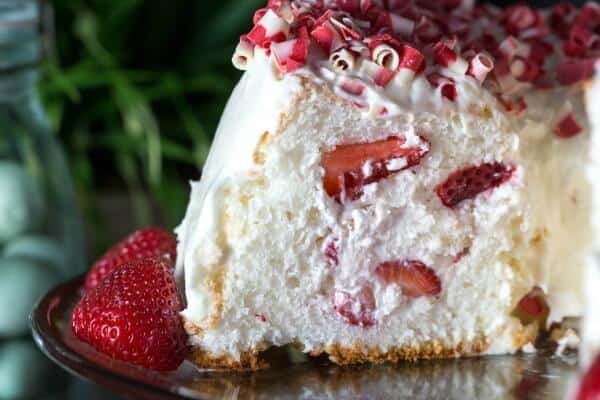 When I was growing up, this Strawberry Filled Angel Food Cake was one of my favorite desserts that my mom would make for our family. Hello Y’all! (Did I say that right?) Debbie with Made From Pinterest/This Grandma Is Fun here and I am over the top excited to be invited to share at Restless Chipotle today. I know that all y’all love Marye and all of her delicious Tex Mex and Southern recipes here at Restless Chipotle so I’m hoping that you won’t throw any tomatoes at me when I confess that I am a beach girl and not from the south. I know, I know, but maybe you’ll forgive me after trying the recipe that I am sharing with you today. My mom used to make this when I was a kid and everyone would always ask for the recipe and I remember being SO proud that my mom made something so fancy. Only later when I was a little older did she tell me how easy it was! Starting with a light and fluffy angel food cake, you then scoop out the middle and fill with strawberries and whipped cream. It may look and sound fancy, but it is oh-so easy! Just keep reading and I’ll show you how. Once you start slicing this cake and serve it up, people will wonder how you made it. Oh and did I mention the Cream Cheese Frosting? You either like cream cheese or you’re wrong. That’s all there is to it. So from my mother’s recipe box to you, may I present my favorite Strawberry Filled Angel Food Cake. Let’s get baking! If you’re looking for an almost-instant recipe give this sweet dessert charcuterie board a try! 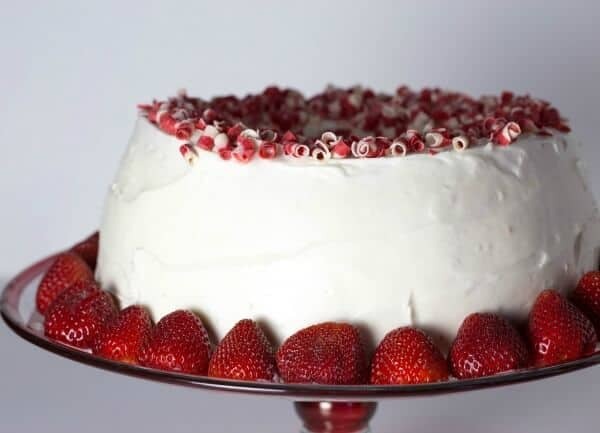 Light, sweet angel food cake is filled with a rich strawberry and cream mixture. It's the perfect Spring or Easter dessert! Garnishment as desired. , ,sprinkles, non-pareils, or chocolate curls. I found my red and white chocolate curls at a gourmet food store nearby. Prepare and bake Angel Food Cake per the instructions on the box. When cool, cut the top off of the cake. Use a long, serrated knife and keep it as level as possible while cutting. Cut about 3/4 to 1 inch down from the top of the cake. Remove top of cake. After the top has been removed, cut along the inside of the cake near the center hole. Use a shorter serrated knife and cut around the entire circle. Then cut around the outside edge of the cake. I usually cut about 1/2 - 3/4 inches away from the edge. Slightly remove the inside of the angel food making sure you leave some cake at the bottom. Reserve what you remove to add to the filling. With a beater, whip your whipped cream and add the desired amount of powdered sugar to taste. Combine 1 to 2 cups of whipped cream to the strawberries and mix. 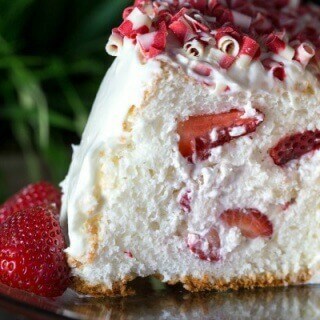 Cut the angel food cake that you removed from the cake into cubes and add to the strawberries and whipped cream. Spoon the strawberry mixture into the inside of the angel food cake. Fill to the top and even mound the filling. Replace the top of the cake. Blend all ingredients until well incorporated and there are no lumps. With an offset spatula, frost the angel food cake. If the frosting is too stiff, you can add a little bit of whipped cream if you have any left over from the strawberry mixture. Garnish with cut strawberries at the base if desired. Garnish with a topping if desired. Sprinkles, non-pareils or chocolate curls. I found my red and white chocolate curls at a gourmet food store nearby. When serving, use a long serrated knife to slice the cake. Well, there ya have it. This is a favorite of mine and I hope that it becomes a favorite of yours too! What a delicious dessert idea! 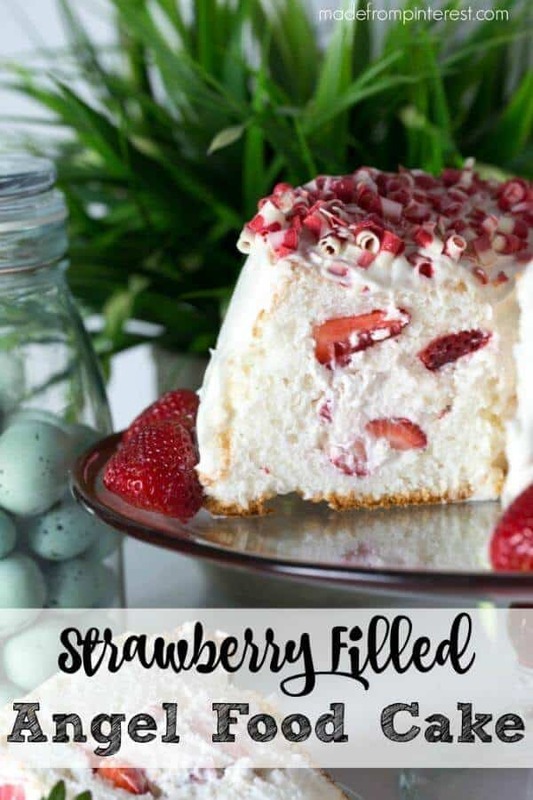 I never thought of filling an angel food cake before but I’ve definitely got to try it! You’re mom had a fabulous idea! This is so fun, and it looks and sounds so delicious, and yes, fancy! Love it! What a great way to dress up an angel food cake! Looks delicious! This looks amazing! Perfect for spring! “You either like cream cheese or you’re wrong.” Ha ha, cracked me up! Cake looks incredible!